The Titan Hookah is a magnificent 30" Triple Hose Hookah that is primarily used by avid Hookah smokers who are interested in smoking with a larger group of friends. 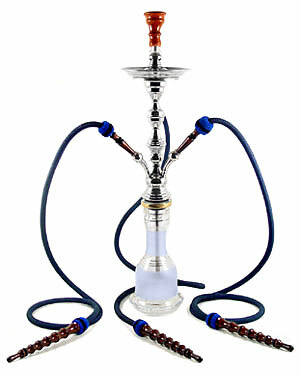 This Hookah is imported directly from Egypt and is made of a high quality Stainless Steel material. The Titan contains a Rubber Stopper that allows for up to three Hookah smokers to use the Hookah at the same time. Whether smoking alone, or with a group of friends, this Hookah Pipe is guaranteed to make an undeniable presence at any party. This Hookah may be used for both decorative and smoking pleasures, providing entertainment for years to come.